And good afternoon, Oscar watchers! It's a wet red carpet in L.A.
And Marion Cotillard's dress appears to have been designed for some alien who's pregnant in the back. It is however, Christian Dior couture, which Marion pronounced in such a deliciously French way. She does, of course, look lovely. Despite. Lots of white/silver/grey looks tonight. And a cheery red tuxedo, on David Oyelowo. Felicity Jones by Kevork Djansezian/Getty. 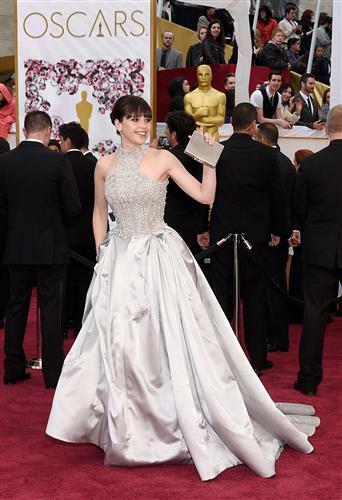 And here's Felicity Jones, in her new Oscar-night bangs. Pretty dress, but the color makes it hard to see the detailing. It has been my experience that getting bangs for a special event is a bad idea, but maybe they're extensions. Felicity is, of course, nominated for "The Theory of Everything," in That Category That Everyone Knows Julianne Moore Will Win. Marion Cotillard by Jason Merritt/Getty. I'm watching on ABC; there's also coverage on E!, but Ryan and Giuliana were already getting on my last nerve. Marion Cotillard, demonstrating her very French superpower in not looking ridiculous in this dress. Hmm: Why is there not an X-Man whose superpower is strutting around wearing couture dresses and looking amazing? Chrissy Teigan is the early winner tonight in the Here's My Right Leg category, in honor of Angelina Jolie (and her very deeply slit dress) a few years back. Laura Dern by Jordan Strauss/Invision/AP. Nominee Laura Dern, looking very lovely. Though the dress looks a bit like it might have been repurposed from "Game of Thrones." Hi Moira, red carpet time. Will we drink every time a man is asked who he's wearing? Hi Terri! Yes, and every time a woman gets asked about her WORK. Actually, the red carpet chitchat seems mildly less inane than usual. But the night is young. Maybe we're just getting used to it. Robin Roberts just announced that "we are just a little more than an hour away from the Oscars kicking off." Actually it's almost an hour and a half, Robin. Keep stretching. Hello readers! What's your favorite red carpet look so far? I kind of love the fact that so far, most of the women are wearing white or grey, and a few of the men are rocking some color: i.e. David Oyelowo in red, Eddie Redmayne in blue. And will.i.am is wearing a fabulous sort of striped tunic, which I covet. I liked the red dress Dakota wore - simple and gorgeous. I liked it too. And Dakota might just squeak in under my No Ponytails on The Red Carpet For Women Under 25 rule, too. Et Voila! Dakota in red, by Jason Merritt/Getty. Dakota Johnson, below, who I believe is a presenter tonight. Rosamund Pike is on ABC right now, and she's wearing a lovely red dress that fits! Let's have a moment of silence for her truly awful white dress at the Golden Globes. Dakota is breaking your no-bangs rule, though, Moira. No, she's had the bangs for a while. I'm just relieved that she's not having to recite "Fifty Shades of Grey" dialogue on the red carpet. 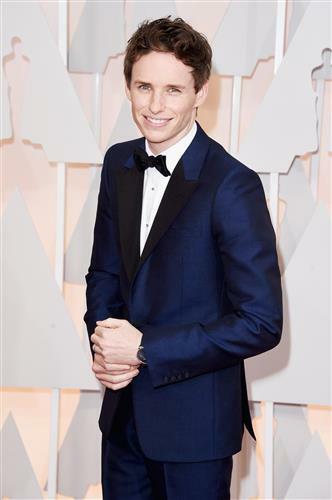 There's something so puppyish about Eddie Redmayne, isn't there? He's just always so chipper. What's with the presenters wearing colors that clash with whomever they interview unless they're wearing black or silver. Yes, that hot pink dress is, as my mother would say, A Bit Much. We just fell silent in the room here, agreeing that we all have a wee crush on Mr. Redmayne. Yes, but it's quite artful. Pity nobody asked him about it. Speak for yourself, Mrs. Chris. 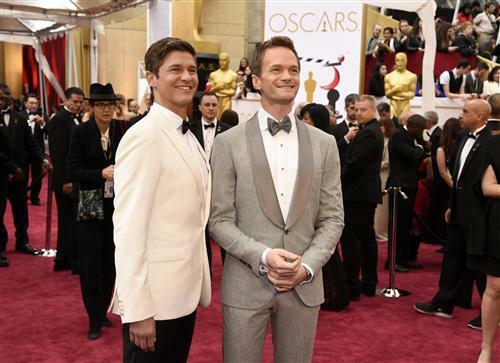 Neil Patrick Harris and his husband David Burka look quite dashing. The silver tux on Neil is an interesting choice -- won't it clash with Oscar -- but he's making it work. Ah, they're talking about movie costumes. Costume design is one of my favorite categories; this year, I think Grand Budapest Hotel will win, for designer Milena Canonero (whose first design credit was "A Clockwork Orange"). Eddie Redmayne by Jason Merritt. For the record, Mr. Redmayne is 33. Obviously he employs some sort of Harry Potter magic. I would like to question the continuing use of "best accessory" for mom, Melanie Griffith. C'mon! Agreed! Why not just "best date"? By the way: somebody announced, earlier on E!, that there will be a tribute to "The Sound of Music" as part of tonight's ceremony. I am SO ready to sing along . . .
David Burtka and Neil Patrick Harris by Chris Pizzello.